Some of you may recall an experiment I ran a month or so ago, the "Answer Similar Questions" hook. It didn't work quite like we'd hoped, but the data suggest there's some promise there. The quality of the search in the experiment was quite poor, which was noted both here on Meta and in subsequent analysis of the results. I believe before anything else is tried, we have to nail down a better search. Rather than just make our best guess search and then subject everyone to it test it, we're going to try something we've done before and tap Meta's answering know-how to build it. I've thrown together a little page that lets any logged-in Stack Overflow user twist the knobs on our search service. The goal is to produce a search which, given just your recently-answered question, produces a small list of questions that you might want to answer. Question/Answer Link - indicates the question to use as input, and isn't strictly part of the query (it won't be saved). More like this - corresponds to a more like this query. It is based on question titles, with various analyzers applied. Fuzzy like this - corresponds to a fuzzy like this query. It is also based on question titles. Tag Impact - how to consider tags. Require primary tag - all results must have the first tag on the provided question. Boost any shared tag - the applies a boost for each tag in common with the provided question. 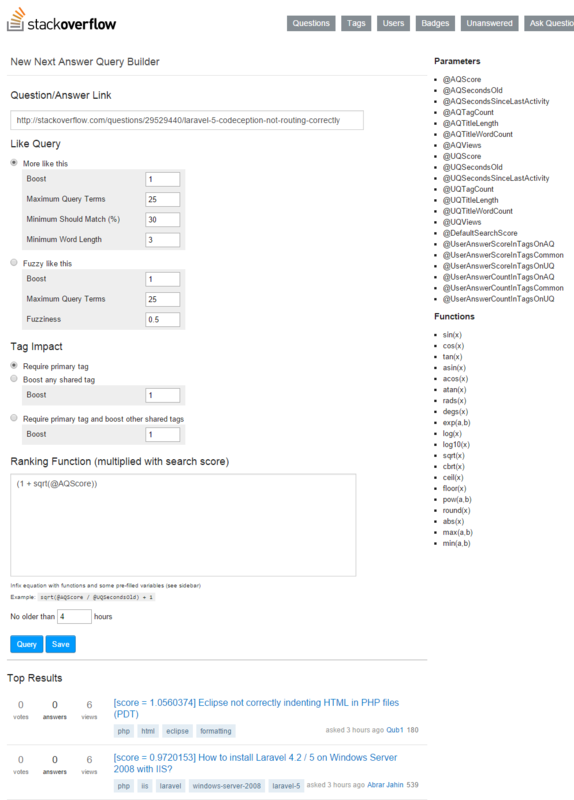 Require primary tag and boost other shared tags - a combination of the two prior. The primary tag is required, and any other tags in common with the provided question get a configurable boost. No older than - will filter out any questions older than the given number of hours (the rationale being that maybe old unanswered questions are unanswered for a reason). And finally the Additional Ranking Function - this takes an infix function (basic operators +, -, *, /, function calls, and grouping with (); no variables or anything fancy), which is calculated for each question, and then multiplied with the standard Elasticsearch document score. It corresponds to a function score query. A set of parameters, using a @ sigil, are also provided for use in the Ranking Function: those prefixed by AQ refer to the passed/"just answered" question and are constant for a query's run, while those prefixed by UQ refer to the under-consideration/"unanswered" question, and will vary. @DefaultSearchScore is the score Elasticsearch would assign to the document in the absence of the ranking function. These are the knobs we think matter most, but if you can make a case for another parameter or option, please do so as a comment to this question! Note that some things won't be possible due to how we index questions. Questions must be in a "normal"-state, not locked, closed, deleted, etc. For safety reasons, there's a throttle (1 query every 30 seconds), but since I've been evaluating each question for its "answer-ability" I haven't found that too onerous. Please save any promising queries, and post links and details as answers to this question. A link to a query, saved from the example show above. this interface has been disabled, the winning(-est) query was proposed by Travis J in this answer. Analysis showed an increase in second answer rate, and that the answers so posted were typically better (as measured by reception w.r.t. voting). The actual "next answer suggestion"-feature remains disabled while final adjustments are made (exposing the dismissal setting, tweaks around answer flow, changes to prompting logic, etc.). I'll probably be posting again in the coming weeks with the final-ish design. What I'm REALLY missing is a way to NEGATE some tag; for example I like to answer Java questions, but I like "pure" Java, not all of that framework configuration and similar questions. I would like a way to explicitly exclude them. And an easy way to save and call my tag list with a single click from every page, like just over the tag suggestion on the left. If this exists and I'm missing it, please enlighten me. I like to look at newest questions when answering. Especially questions which have an upvote and are generating a good set of views. This means that on https://stackoverflow.com/questions?sort=newest sometimes there aren't any candidates. I already have it paginated by 50, but it quickly becomes hard, and sometimes discouraging, to flip through 300 questions posted in the past hour before finding a candidate. Repeating this process is not very fun either, so I tend to just wait on the first page and refresh. Using this approach, I created a query which was weighted by votes, then views, then time. I placed extra weight on votes (100 times), because I figured that I would rather look a post with 2 votes than with 150 views. Although, that changes depending on time, because newer is better in my opinion. I have tried this metric with several posts and have found it to produce quality results so far. The downside is that some of the results seem a little broad and I am not sure if that is a result of a failure in my metric or just new questions in general. See my query version here. * The + 1s are needed when the previous results on 0 to turn it to 1 and apply the other factor's weight, so the multiplication would break a tie to a lot of questions with different weights on other factors just because a question score of 0, for example. Please, also note that the question you provide to the query should be chosen carefully since it'll rely on it when searching for the next question. Try providing a good elaborate question containing the main tags you are looking for, and you'll probably get better results, independently of the query you're using. SE is still underestimating the importance of edits. I'm amazed that edits aren't factored into this at all. I'm not really an SO user, but if this is to be rolled out elsewhere, then edits really should count on other sites. Sometimes a question is unanswerable/shouldn't-be-answered before an edit. "Last Activity" is closest, but I'm guessing that catches a lot more than editing. I would propose that recent edits should be factored in, and more weight should be given to posts edited by other users than ones edited only by the OP. Furthermore, it shouldn't be too hard to calculate significant edits vs. simple stylistic changes, and obviously the former should be given plenty of weight, whilst the latter shouldn't matter very much at all. Also, some times I am looking at good questions, you know, the kind of questions with meat around the bone written by a user with some rep (usually, but not always) and some times I prefer crawling through a couple of unanswered questions with small text trying to help out figure out what the problem is and at least raise the question quality with comments. So if I hadn't lost my magical wand, I'd love to have the ability to search next question to answer based on the users' reputation. Having the search score multiplied by how close the two users' reputation is could help see more similar questions. I'll try to figure the math later if there's interest. What happened to the 'Find your next answer' query? Would it be feasible to improve question discoverability? I need (a lot of) help to write a query for the Stack Exchange Data Explorer: should I ask on Stack Overflow or on Meta Stack Exchange?